Discover the true benefits of using Ceramic Knives with Rocknife. When you break a china plate, you will get an incredibly sharp edge, just like glass. Now, if you were to temper it, treat it and sharpen it, you will have a truly formidable slicing and cutting blade, exactly like a Ceramic Knife. The benefits of Ceramic Knives are more than you may think. When you think of Ceramic, you might be thinking of pottery or tiles and possibly visualise that Ceramic knives are made from the same materials. In fact, Ceramic Knives are made of a very hard and tough Zirconium Dioxide Ceramic and fired at an intense heat to harden the blade. The blade is then sharpened on a grinding wheel by skilled workers and coated in a diamond-dust, until the blade is razor sharp. On the Mohs scale of mineral hardness, Zirconia measures 8.5, while steel is 4.5. Hardened steel is between 7.5 and 8, whilst diamond is a 10. 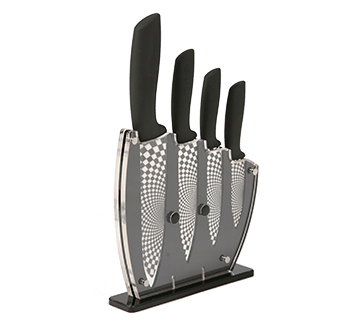 The hardness of the blade means the level of which it stays sharp and therefore, Ceramic Knives will stay sharper for a lot longer than your normal steel kitchen knife. Because of the sharpness of Ceramic Chef Knives, they now form a staple part of a chef’s toolkit. Chefs are renown for having lots of knives and each one has a particular purpose. When it comes to preparing Fruit and Vegetables, most chefs will automatically turn to their Ceramic Knife. Another key feature is their weight. Ceramic kitchen knives are far lighter and when chopping large quantities of food, it is a lot less tiring to use a Ceramic blade. Ceramic Knives are durable. Their weight is well distributed, giving you more control over the blade. They are impervious to rust and food stains and are specialist tools for the cutting and peeling of fruit and vegetables, especially soft fruit such as figs, tomatoes, grapes, onions and so on. Knives made from Ceramic do not have the corrosion reaction that steel knives do because of their sharpness and because they are less absorbent. Substances such as salts, acids and juices do not affect Ceramic Knives and therefore, do not change the taste of foods. In fact, because the cut is cleaner, food stays fresher for longer when you have used a Ceramic blade. The Ceramic Knife keeps its sharpness for longer than metal knives and thus last longer. Steel knives tend to show their age from long-term use. Ceramic Knives, however, will keep their good appearance for a much longer time. Ceramic Chef Knives - Benefits. If you walk into a shop to buy a knife, the won't charge you for taking it away. We want to offer you the same excellent service! Whether you buy a single knife, or a full set, we give you free delivery every time. It's actually a fairer way to delivery your Rocknife. When you go into a normal shop - they don't charge you for delivery - yet that product was packaged and delivered to that shop. So why should we? 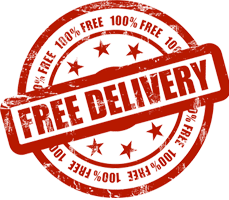 We believe in a fairer and more open delivery price, we build the price into our products, it means you pay a fair delivery cost no matter if you order one 3 inch Rocknife or a whole box of 6 inch ceramic knives. You always pay a fair price.